The world of technology advances very fast and the forms of payment we have nowadays are several. Gone are the desperate searches for an automatic teller machine in San Fernando to pay the purchase. – Plastic cards: it is the most traditional way to pay without giving money. – PayPal: has made a continuous effort to try to make people use their “virtual” payment service to start forgetting even the credit cards. Perhaps the commissions it charges prevent them from going further. – Payment applications person to person: I do not want to advertise any, but I really like Twyp. With this type of applications you can send money for free to any of your contacts (as long as you also have the application installed, of course). It has become a convenient way to pay the bar bill. –Pay with the mobile or clock: Companies like Samsung or Apple have their own payment methods: Samsung Pay and Apple Pay. As simple as bringing your mobile (or your watch) to the payment terminal and authorizing it. Wait a minute……with the pin? Yes, with the pin. Getting your ear closer to the payment terminal or taking off your glasses and getting them closer with the hands for making people believe you are listening to what the dataphone is whispering it will be up to you. Being honest, having the possibility of paying with the pin of the glasses, I hope that more than one approaches the head to the terminal. If nobody does, I will feel cheated. The technology of glasses is called Wave Shades. This technology is based on a chip with NFC technology located on one of its pins. It may seem more like an advertising strategy than a new revolution of contactless payments, but the truth is that it is a new concept that does not go unnoticed. The first tryout payment with the pin has taken place these days during Quiksilver Pro, a competition organized by the WSL (World Surf League) that took place in Gold Coast, Australia. In this event Visa is sponsor, so be careful not to use them. About 50 pairs of glasses were distributed to collaborators and participants as a test and their functionality will be checked. Take it easy, my friend. The cost or availability of the glasses is unknown yet. It seems that Visa is trying the water with the toe to see how cold it is. Depending on that, the neck will get wet a little or the pump will be thrown. Or who knows, maybe it will go to the towel without bathing. Once they pass this first phase, the idea will be to reach some agreement with some bank that wants to help with the definitive deployment. 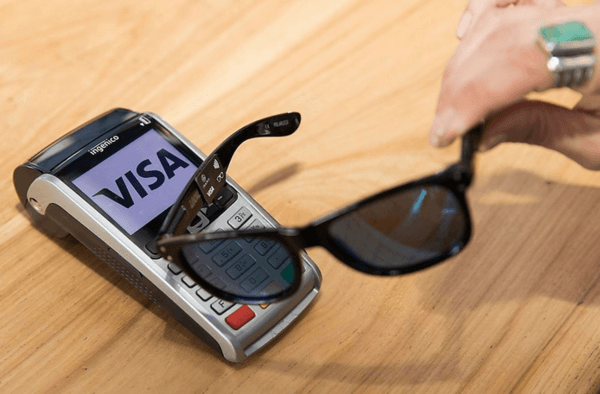 “These glasses go with our slogan it is where you need it,” said Chris Curtin, head of brand and marketing innovation at Visa to the US network CNBC. The idea they have is to take objects that people do not believe they can be used to pay, as sunglasses are (or even a ring) and put them on the market to show that maybe they serve for that purpose. The use of this technology is also somewhat limited to external conditions, such as wearing sunglasses at night or on rainy days. In some cities, sunny days are rare … in Seville, for example, rainy days are rare. Chris Curtin, director of the brand and part of VISA marketing group, defended before CNBC that they will continue to investigate payment methods with everyday objects. Who knows… Maybe one day the concept of the wallet with cards, coins and bills disappears from our lives and we can make payments with elements that we do not think today. Or with some that we already use (glasses, ring, bracelet …), or some that we still do not imagine (chip implanted). It will be necessary to pay attention to what news have prepared companies like Visa in its mission to make credit cards obsolete. By the way, be careful if you are one of those who are leaving the glasses out there, as losing these glasses can be dangerous. What do you think about this new possible form of payment? Tell us.